After many years of sub-par economic growth in the United States, isolationists on the Right are now echoing the arguments of isolationists on the Left — arguments that are now being deployed to scare Congress and the public about immigration. Tim and I noticed this trend two years ago when we started to think about writing Balance, and the many Great Powers in history that fell victim to isolationism and the collective sense of loss aversion. 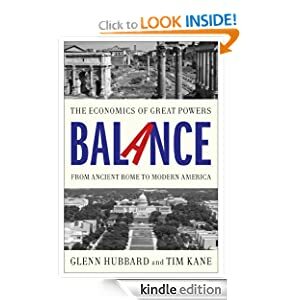 America really needs this history lesson about maintaining its economic balance, its faith in free and open markets, and its entrepreneurial attitude more than ever. Heard you on the DR (NPR) show. You did well, despite DRs constant & very obvious slant to the left wrt her parsed comments & questions. I will seek out your book.